We could not have done this critical flight without your kind support and pledges. This mission was an emotionally tough one. But a big hat tip goes out to our patrons for helping to support us to save Tonto and Ranger. 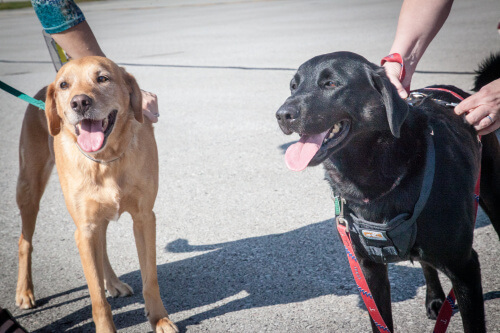 Tonoto, a female, black labrador retriever and Ranger, a male, golden labrador retriever, belong to a couple that serves on active duty in the US Air Force. Due to ongoing, overlapping deployments they are no longer able to keep the dogs they rescued as puppies. Both dogs are 5yrs old and at their age, as owner surrenders, Tonto especially because people have a misconception that black dogs are evil, and Ranger don’t have a very good chance of making it out alive of a kill shelter. North Carolina has one of the highest number of kill shelters in the county. Steph Tjosvold, of Midwest Animal Rescue & Services in St. Paul, Minnesota agreed to bring the dogs into the rescue but needed help getting them from Raleigh, NC to Minnesota. 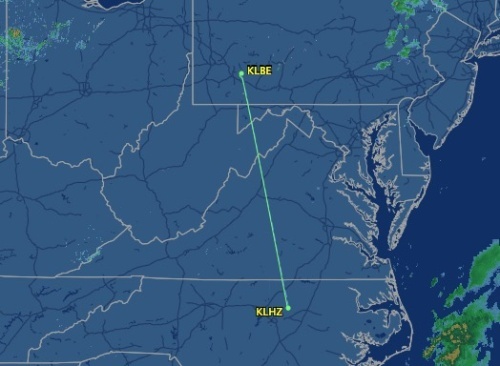 Steph posted a request asking for help getting the dogs to Pennsylvania by Sept. 23rd where she had already retained a pilot to fly them from PA to Wisconsin. From Wisconsin she had a flight set to bring them into MN. Where she had forever homes already for them each. She asked, to please help her honor their service to our country by saving their beloved dogs. We responded and arranged to meet the owner, at our airfield on Sept 22nd at 7:30 am. He had almost a 2 hr drive to get to us but he wanted his dogs to go to a good home and was willing to do anything to get them there. On one attempt he tried to pay a commercial airline to fly his dogs. But after he purchased all of the required equipment, specified on their website to fly the dogs and tickets. He was told when he got to the airport that the crates he’d purchases were the wrong ones. Even though it was exactly what they had on the website. Military members do not make that much money to cover mistakes like that! And the airline was unwilling to accommodate them. 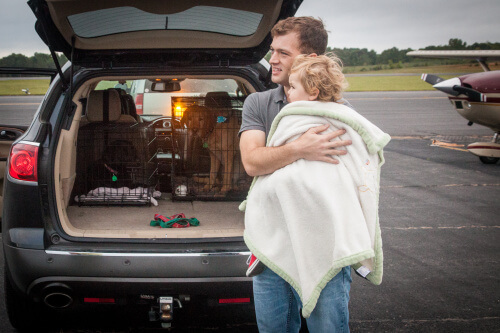 When we met at the our airport, Aaron came with his 2 ½ yr old son, Luke and both dogs. At this point Pam got teary eyed. You could tell, these were well loved dogs and it was really difficult for Arron to part with them. Tonto is a real sweetheart and loves to snuggle and kiss your face. Ranger is a big teddy bear and loves playing with balls and carrying them around. There was a beat up soft ball in his crate with him. Aaron said he’s never without something to carry around in his mouth. Aaron said his goodbye’s to his best friends and with emotional goodbyes all around he and Luke drove back home. 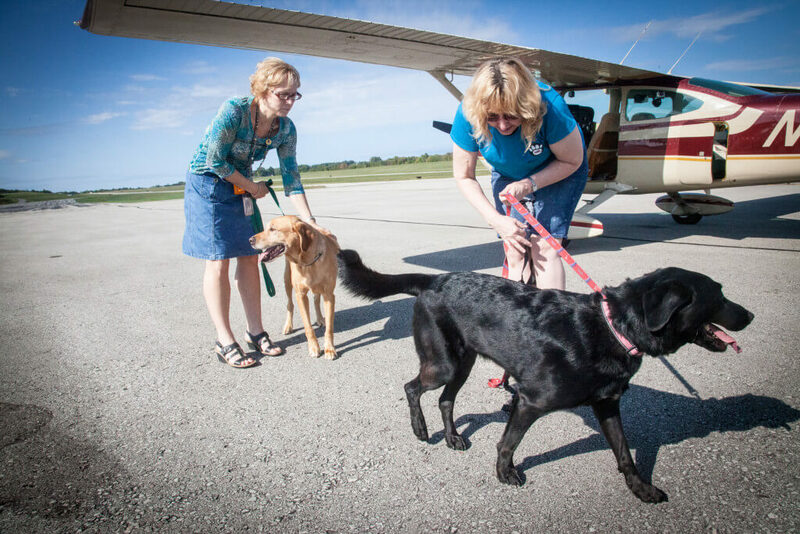 With, Pam and both dogs sitting in the back of the plane we were off to PA for their 1st leg to their new homes. 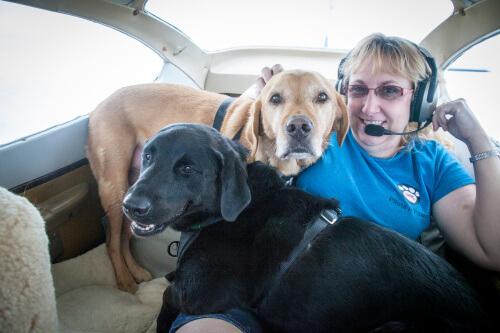 For the first hour of our flight, Tonto lounged across Pam’s lap and Ranger sat with his head on the back seat looking out the window. After some rearranging in the back both dogs took over the back seat for a little snooze. In Latrobe, Pennsylvania we met Heidi who took them in as a foster for the night. Heidi and her husband have 4 dogs of their own but when she heard about their situation she couldn’t refuse either. We said our goodbyes to our new friends, wished them well in their new homes and as usual Pam cried.